Form fields or vector fields over a manifold (as opposed to forms and vectors) do not form a vector space. They form a module. 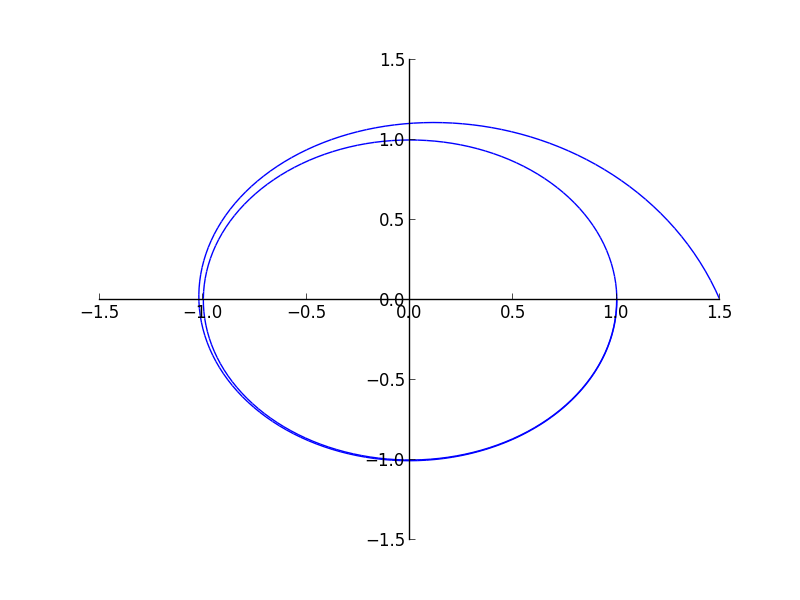 The difference is that the scalars of a vector space form an algebraic field while the scalars of a module form a ring. For us humans (as opposed to “those higher beings that I do not understand (a.k.a. mathematicians)”) this means that the scalars in the vector field can divide each other while the scalars in the spaces spanned by fields (i.e. a module) can not. And just so we all can become even more confused: This has nothing to do with the fact that the “components” of each form field or vector field in certain basis are functions, i.e. themselves elements of a vector space with infinite number of dimensions. The first way to see this module-not-a-vector-space characteristic is by showing directly that the scalars that form the “coordinate components” of a vector field can not always be divided, even if they are not identically zero. Take, for instance the, manifold with the polar coordinate system and look at the vector . The “scalars” are and . Obviously we can not divide the former by the latter because it will be undefined at . Another, more amusing way to show that the space spanned by these fields is not a vector space is to explicitly show that a property expected from vector spaces is not fulfilled. Namely, that in dimensions an -uple of linearly independent elements forms a basis. However, in the case of fields over a manifold we can easily have a number of fields that are linearly independent over the manifold as a whole, and are at the same time linearly dependent (or simply equal to zero) on a subdomain. Hence, we have an -uple of linearly independent fields that can not be linearly combined to represent another arbitrary field. This post provides a summary of all mathematical types of expression implemented in the diffgeom module. I have chosen not to mention any python classes or other implementation details at all. This table shows how an object expected by the user to be of certain mathematical type operates on another object. If the expectations of a user familiar with differential geometry do not meet the actual implementation, this is a bug in the implementation. commutator of vector fields Behaves as a regular vector field. Lie derivative (the argument is “called” on construction time) NA You specify the object to be derived on creation. The Lie derivative of any object is an object of the same type. An “easy” solution to the Einstein equation (in free space) is the spherically symmetric Schwarzschild solution. The pdf bellow shows how one can use the diffgeom module in order to get the equations describing this solution. One starts with the most general spherically symmetrical metric and by using Einstein equation deduces the equations that must be fulfilled by the components of the metric (in the chosen basis). The work on the differential geometry module has not progressed much this week. I have fixed some minor issues, docstrings and naming conventions, however I have not done much with respect to the implementation of form fields as there are still some questions about the design to be ironed out. Instead I focused on studying two of the features that SymPy presents and that I will use heavily. The first is the simplification routine that I will discuss another time. 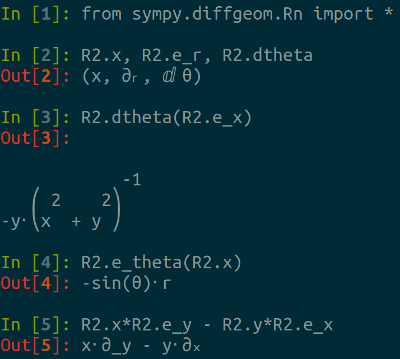 The second one is the different solvers implement in SymPy. First of all, I have a very hard time getting used to the various output that the solvers provide. The algebraic equations solver, for example, can return either an empty list or a None instance if there is no solution. If there are solutions it can return a list of tuples of solutions, or a list of dictionaries of solutions, or a list of solutions if there is only one variable to solve for, or the solution itself if the solution is unique… Thankfully, a remedy for this was implemented by Christopher Smith. In pull request 1324 he provided some flags that force the solver to return the solutions in a canonical form. I am very grateful for his work and I hope that in the not too distant future what he has done will become the default behavior. I also hope that the solver will get refactored, because internally it is still a mess of different possible outputs that are canonicalized only at the very end. It is possible that I will work on this later. Then there is the ODE module. I already need this solver in order to work with the integral curves that my code produces. It is a very advanced solver written a few years ago by Aaron Meurer as part of his GSoC project. However, it still does not support systems of ODEs or solving for initial conditions. With Aaron’s help I have started those. The main difficulty is that I am covering only the simplest cases, however the new API must be futureproof. Moreover, here I again have a problem with the various outputs that can be produced by the ODE solver. Solutions are always returned as Equation instances (which is necessary, as some solutions can be in implicit form), however if there are multiple solutions they are returned in a list, while single solutions are returned themselves (not in a list). Anyway, the structure of the ODE module is straightforward so this should not be too hard to work around. This week I will probably finish my work with the ODE solver and proceed to the form fields. The code on the differential geometry side is ready, however before showing it I will first extend the ODE solver in order to have more interesting examples. The next few moths will be interesting. I got accepted in the Google Summer of Code program and I am already starting to worry (irrationally) about the project and the schedule. I will be working on a differential geometry module for SymPy (and time permitting, some more advanced tensor algebra). Basically, I want to create the boilerplate that will permit defining some scalar/vector/form/tensor field in an arbitrary coordinate system, then doing some coordinate-system-independent operations on the field (with hopefully coordinate-system-independent simplifications) and, finally, getting the equations describing the final result in another arbitrary coordinate system. With this in mind, the details about the project can be seen on the proposal page. Most of it (all except the tensor algebra that I may work on at the end) is based on the work of Gerald Jay Sussman and Jack Wisdom on “Functional Differential Geometry”. 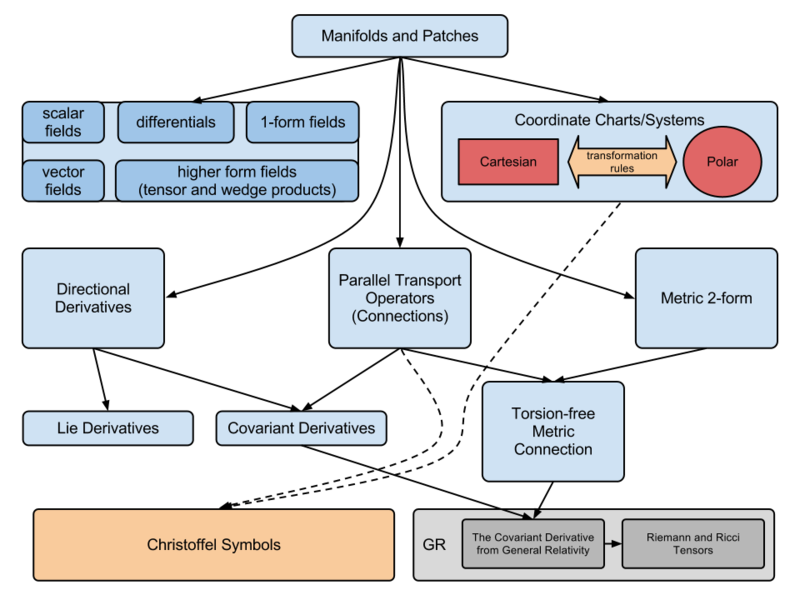 I suppose that this project started as a part of their superb book “Structure and Interpretation of Classical Mechanics” (I really have to read this book if I am to call myself a physicist) and the accompanying “Scheme Mechanics” software. By the way, reading the Scheme code is a wonderful experience. This language is beautiful! The authors are also actively updating their code and a newer, more detailed paper on the project can be found here. Most of my work will be reading the Scheme code and tracing corner cases in SymPy. My workflow will probably consist of implementing some notion from “Functional Differential Geometry” in SymPy and only when I get to semi-working state comparing with the original Scheme code for ideas, then repeating the process on the next part of the system. This way I will be less susceptible to implementing Scheme idioms in Python. Writing the final version of each function/class of my module will probably take very little time. Most of the time will be dedicated to removing/studying corner cases and assumptions in SymPy’s codebase (more about these later) and experimenting with different approaches for the module structure (and of course reading/deciphering the work of Wisdom and Sussman). These details make it a bit unclear how to implement things like CoordinateSystem objects which learn during their existence how to transform to other coordinate systems (thus their implementation in code is a mutable object) but at the same time they are the same mathematical object. Anyway, from what I have seen just having a persistent hash and a correct srepr should be enough. I wonder how tabu it is to change your _args after the creation of the class. Why I need to worry about caching (thus the hash) and rebuilding (thus the srepr) is still unclear to me, but I will dedicate whole posts to them later on when I have the explanation. The caching is presumably for performance. It is the need for all that fancy magic that does not permit duck typing in SymPy. If you do not subclass Basic, you can not be part of SymPy, no matter the interfaces that you support. Then there is the question of using the container subclasses of Expr. Things like Add and Mul, which I would have expected to be just containers. However, they are not. They also do some partial canonicalization, but at the moment their exact role (and more importantly, what they don’t do) is very unclear to me. There was much discussion about AST trees and canonicalization on the mailing list, if you are interested, and how exactly to separate the different duties that Add and Mul have, but as this is enough work for another GSoC I decided to just stop thinking about that and use them in the simples way possible: just as containers. There is one drawback to this approach. The sum of two vector fields for example is still a vector field and the object that represents the sum should have all the methods of the object representing one of the fields, however Add does not have the same methods as VectorField. The solution that was already used in the matrix module was to create classes like MatrixAdd, and the same was done in the quantum physics module. However, I fear such proliferation of classes for it becomes unsustainable as the number of different modules grows. What happens when I want to combine two objects from the disjoint modules? This is why I simply use Add and Mul and implement helper functions that are not part of the class. These helper functions will ideally be merged in some future canonicalizer that comes about from separating the container and canonicalization parts of Add and Mul. 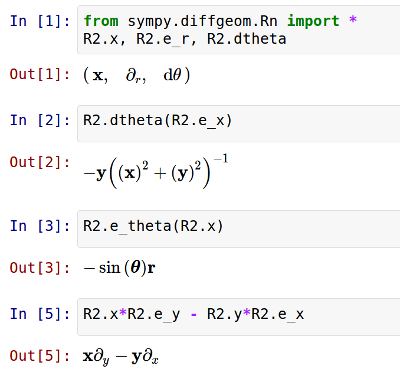 One last remark is that I will probably have to work on sympify and the sympification of matrices, as I will use coordinate tuples (column vectors) quite often. Then there is the distinction between Application and Function and all the magic with metaclasses that seems very hard to justify. But probably I will write entire posts in which I try to understand why the metaclasses in the core are necessary.